The rules for this award are: First, choose a minimum of seven blogs that you find brilliant in content or design. 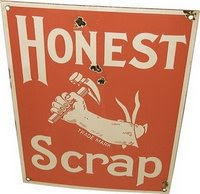 Secondly, show the seven winners' names and links on your blog, and leave a comment informing them that they were prized with “Honest Scrap". Another award to add to your list of awards. Lastly, list at least ten honest things about yourself. There are so many people deserving of this award it was hard to pick only 7. 1. Big Hair Envy- She is my reason for doing this blog thing. If it wasn’t for her, I never would have gotten into this. 3. Suz over at Busy as a Bee - I love her desire to save the world. And her sarcasm makes me laugh. 5. CBW at Life in Matthews- I love her pics and her hilarious stories. 7. Noe Noe Girl- Even though she has already received this award, I felt like I should mention her again since she ALWAYS brings a smile to my face when I read her posts. So, enough about them, let’s talk about me- just kidding. Here are 10 things about me you might not know or care to know J But they are true none the less. 1-When I can find time, I watch “The Hills”, “The City” and the new 90210 (have I mentioned before I just love my DVR and OnDemand) I know, it’s juvenile, but what can I say. I am living vicariously through Lauren and Whitney and for heavens sake, Kelly and Brenda are both back in the 90210. 2-I read all 4 books in the Twilight Series in less than a week. 3-I love the beach, but hate the sand. 4-I have 2 sisters and 3 brothers, yet I am an only child, and no I wasn’t adopted (at least I don’t think so. Am I adopted mom?). 5-I have a FaceBook and I am not ashamed to admit it. Addicted yes, but not ashamed. 7-I love “24” It’s probably my most favorite show on television! 9-I won 1st place for my chili in a chili cook-off at work. I didn’t think it was all that, but apparently it was the hit of the day. I was asked to make it again this year. Bet it’s not as good as BHE’s. 10-I am thankful for my wonderful husband and love him with all my heart. He is my best friend! Happy Friday everyone! I will be spending my weekend at a Cheerleading Competition! Hope everyone’s weekend is filled with tons of fun! I love your list and THANKS so much for the award!!! You are awesome. Oh, the birthday calendar is so cool...I added mine in there in Sept. Not sure if it worked or not. where can I get one of those babies?? Thanks for posting the birthday calendar on your blog. Have a fun week end! Thank you so very much - I am very grateful. I'm also happy to know I'm not the only one with bottomless laundry baskets. I am doing another load as we speak, with plenty more to go.There is a mountain of clean clothes on my bed. I am terrible at doing these award things mostly for two reasons: I do not know how to add stuff to my sidebar (and probably won't until I lose my dial-up internet) and also I am very forgetful. But nevermind all that, thank you so much for thinking of me. Oh, and you need to post that chili recipe. I'm also very happy to hear that BHE makes a good batch, because between her chili and Cool Breeze's BBQ, I'm in for some good eatin'. Hahaha..I hate cleaning period but laundry is my biggest nemesis. Love the blog Honey. Love you too. Can not believe you got me doing this FB thing and now commenting on blogs. Thank you so much! And do not speak of laundry baskets. Thanks. Facebook? I am going to go look for you. Thanks for the award I'll be getting to it soon. Where is your comp. at this weekend and are you going to the one at Disney?